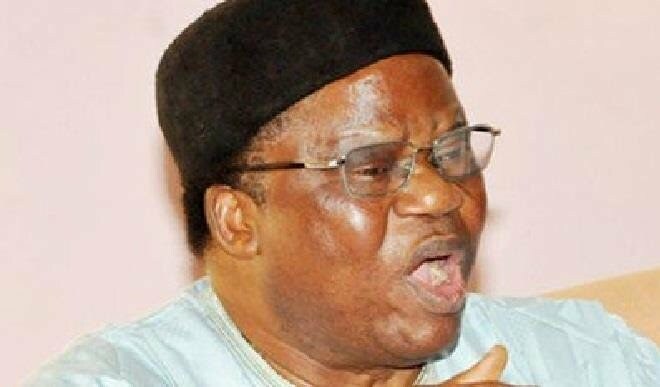 An Ex Minister of Information, Prince Tony Momoh, has expressed fears towards the new N30, 000 minimum wage, signed into law by President Muhammadu Buhari on April 18 would lead to more problems. Momoh, who is also one of the leaders of the All Progressive Congress, APC made the statement while addressing newsmen on Friday in Abuja as part of activities to mark his oak jubilee, 80th birthday celebration. Acccording to him, while he is happy over the new wage, he holds the view that it will lead to a situation where many states will not be able to pay and this will lead to industrial unrest and strikes. 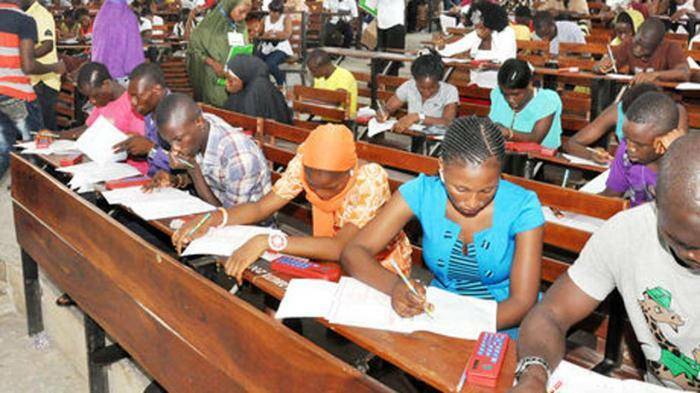 The Candidates of the just concluded Nationwide examination JAMB have voiced out about their tiredness of waiting on their result which has been delayed for reasons of illegal practices by Examination centers. However, the examination body has assured every of it candidates of getting their result if done without any form of malpractices as results are thoroughly screened by professional bodies. All candidates who sat for UTME are enjoined to hold on and not panic in any form. Results Will BE Out SOON! But when faced with questions from special counsel Robert S. Mueller III about the 2016 campaign Trump said his memory failed him. It was an answer — or non-answer — that Trump had used repeatedly before. He offered similarly hazy responses when he faced questions in a civil suit about Trump University, when he was pressed about his net worth in a deposition in another case, when reporters asked about his support for the Iraq War, and when he was quizzed about a key Oval Office encounter with then-FBI Director James B. Comey. 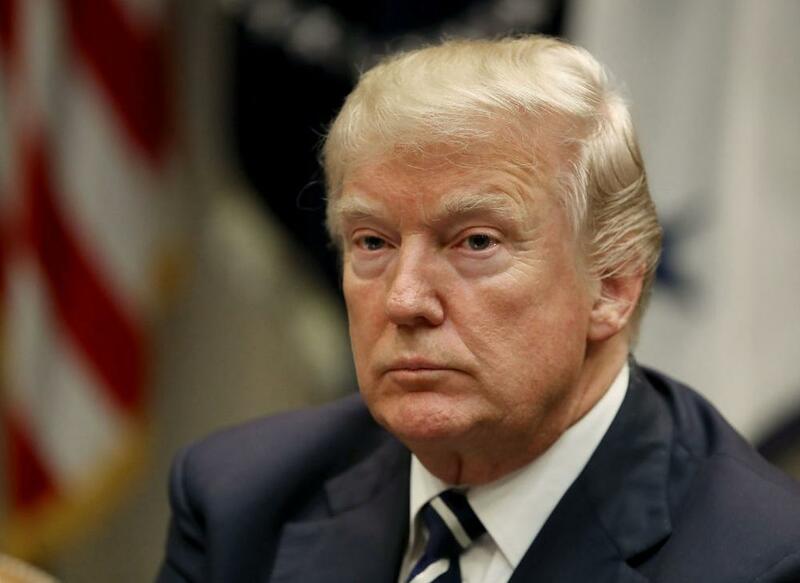 In the case of the special counsel investigation, prosecutors found Trump’s repeated assertions of a faulty memory “inadequate,” according to Mueller’s newly released report. Prosecutors pushed for an in-person interview. “This is the President’s opportunity to voluntarily provide us with information for us to evaluate in the context of all of the evidence we have gathered,” they wrote, according to the report. Trump declined — largely because his lawyers feared the president could misspeak or even lie, The Washington Post has previously reported. In the end, the special counsel decided not to subpoena Trump for an interview, concerned it could lead to a drawn-out court battle, according to the report. Trump’s attorney Rudolph W. Giuliani did not respond to a request for comment Friday about Trump’s memory lapses. Defense attorneys say there’s nothing unusual about a witness — especially one who’s the subject of an investigation — claiming not to recall key details. If they forgot, they forgot. And if they actually didn’t forget, well, how do you show that someone’s lying about the contents of their own mind? In the past, Trump has claimed memory lapses in several cases in which he was been asked to account for his own past statements. Instead of explaining them, Trump said he didn’t remember making them in the first place. “You don’t remember saying that you have one of the best memories in the world?” an attorney once asked Trump during a 2015 deposition for a lawsuit against Trump University. The plaintiffs alleged that the university — really a series of real estate seminars — misled its customers into paying thousands of dollars for little benefit. “I don’t remember that,” Trump responded. He had made the claim just three weeks earlier, in an interview with NBC News. In that case, Trump later settled the lawsuit for $25 million. In a 2007 deposition, Trump faced an attorney who wanted him to explain a claim he had made two years earlier to reporter Timothy L. O’Brien. The claim: Trump’s net worth was $6 billion. “You don’t recall telling him you were worth $6 billion?” said attorney Andrew Ceresney. “I do not. I do not,” Trump said. The claim was important in that case because Trump sued O’Brien for defamation, alleging that O’Brien had lowballed Trump’s net worth in a book. O’Brien’s defense was intent on proving that Trump was an unreliable source of facts about himself — including this fact, about Trump’s net worth. As Trump was claiming to be worth $6 billion, his accountants said he was worth less. To disprove the claim, O’Brien’s attorneys first needed to show Trump made it. After Trump said he didn’t recall the statement, they produced a tape of the interview. “What are you worth right now?” O’Brien asked on the tape. “I would say six” billion, Trump said on the tape. Trump’s lawsuit against O’Brien was later dismissed. In another lawsuit — this one over a failed plan for a Trump-branded building in Fort Lauderdale, Fla. — Trump claimed to have little memory of his interactions with a business associate named Felix Sater, who led the project. As recently as 2010, Sater had office space inside Trump’s executive suites, and a Trump Organization business card. Sater said they had met one-on-one numerous times. Trump has repeatedly said he does not recall an episode Mueller closely scrutinized as a potential act of obstruction of justice by the president: a private Oval Office meeting he had in February 2017 with Comey. The day before, Trump had fired national security adviser Michael Flynn after reports that he lied about his contacts with the Russian ambassador. According to Comey, the president asked to speak to him alone and then said he wanted to talk about Flynn, who was under investigation. Trump told the New York Times several months later that he didn’t recall having a one-on-one conversation with Comey. “Not even that I remember. He was sitting, and I don’t remember even talking to him about any of this stuff,” Trump said to the Times. But the special counsel found that “substantial evidence” corroborated Comey’s account, the report said. Mueller cited as evidence a detailed memo Comey wrote of his encounter with Trump on the day it occurred and the fact that the former FBI director consistently described it under oath before Congress and in interviews with federal investigators. Other administration officials confirmed to the special counsel that Trump shooed them out of the Oval Office to speak to Comey alone that day, the report said. And just hours before the encounter, Trump told New Jersey Gov. Chris Christie (R) that firing Flynn would put an end to the Russia inquiries, the report said. But in the end, Mueller was unable to ask Trump about his memory of the Comey meeting: The president’s lawyers refused to allow him to answer questions from the special counsel related to possible obstruction while in office. 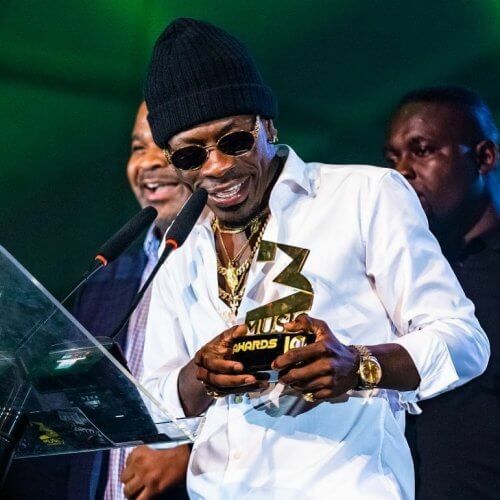 A list Ghanaian dancehall artist Shatta Wale presents yet another brand new release. This one right here is titled “Weekend Love (Weekend Love Riddim)”. This is the follow up to his previous release titled “Summer Time” featuring Gh Cali. The dancehall song was produced by YGF Records. Check it out below. 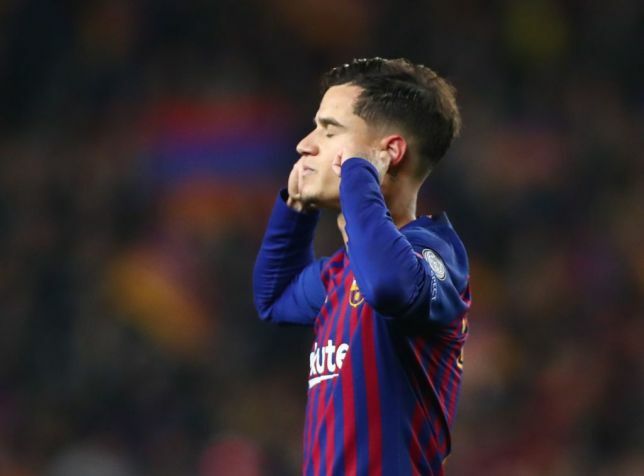 Barcelona Star, Philippe Coutinho has defended his goal celebration against Manchester United in the Champions League after putting his fingers in his ears in a clear message to his Camp Nou detractors. The Brazilian has had a difficult campaign, scoring just five times in La Liga despite arriving at Camp Nou in a deal that could reach £142million, with fans increasingly critical of his displays. But on Tuesday night he showed exactly why Barca spent so much money on him, powering a stunning effort past David de Gea as the Catalans progressed to the semi-finals. but he stuck to his guns on social media afterwards. ‘We should never listen to people who will demotivate us because their speeches only deviate us from the real focus we should take,’ he wrote on Instagram. Coutinho received support from his teammates, with Arthur saying he ‘showed balls’ and Sergio Busquets saying he celebrated ‘with anger and desire’. Coutinho, who could leave Camp Nou, blocked out his haters But others were less kind about Coutinho, with former star Rivaldo telling Marca: ‘It was not a good gesture. He scored a great goal, but it’s never good to do something like that to the fans. ‘The supporters criticise him because they know he has to give more. I don’t know what happened to him during the week, what he read in the newspapers or saw on television, but you have to keep working, think about the next game and score goals.’ Coutinho’s struggles for Barca have seen him linked with a move away from Barcelona, and potentially a return to the Premier League. The villagers mostly women arrived Birnin-Gwari around 3:30pm Wednesday as internally displaced Parsons (IDP’s). This was disclosed by Birnin-Gwari Vanguard for Security and Good Governance in a statement issued to newsmen. ”Kuriga village situated along notorious Birnin-Gwari-Kaduna Highway has been attacked by bandits nine times. 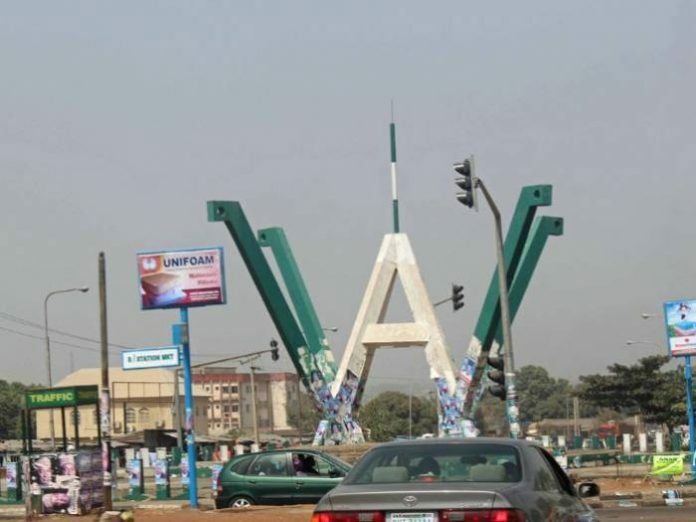 ”The latest was on Tuesday nights in which five women and men were abducted and cattle carted away by bandits,” the statement reads. “We urged all security and intelligence personnel to be on alert and salvage this ugly situation” the group said. It was gathered that the bandits also send a letter today (Thursday) warning the people of Kuriga to leave the area or risk abduction. ‎Contacted the State Command Public Relations Officer DSP Yakubu Sabo didn’t reply text message sent to him seeking clarification. Gaaga Muzik is happy to bring to public notice the release of Larry Gaaga's second single of the year titled “Low” which features Afrobeats heavyweight Wizkid! Low is a low tempo vibe produced by Blaqjerzee who is also credited as a co-writer on this piece and you get to see the Moe Musa directed visuals too! Get ready to update your playlists! A Nigerian man on Facebook has advised men to ensure that their wife is never more successful than them. Echezona Enebeli said it's OK for a man to support his wife but he should never do so to the extent that she becomes richer than him. 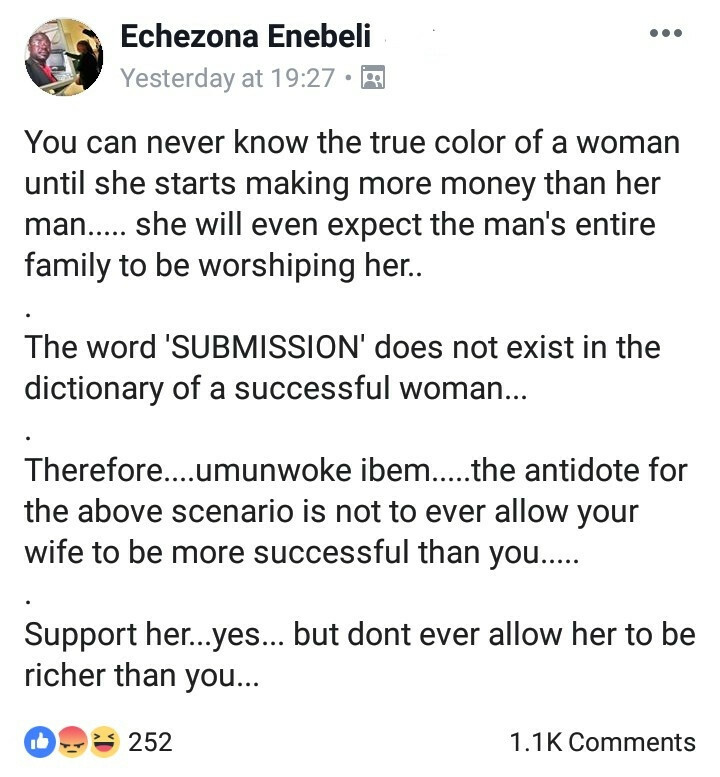 He wrote: "You can never know the true color of a woman until she starts making more money than her man..... she will even expect the man's entire family to be worshiping her..
"Support her...yes... but dont ever allow her to be richer than you..."
What are the women of this generation turning our men into.....??? 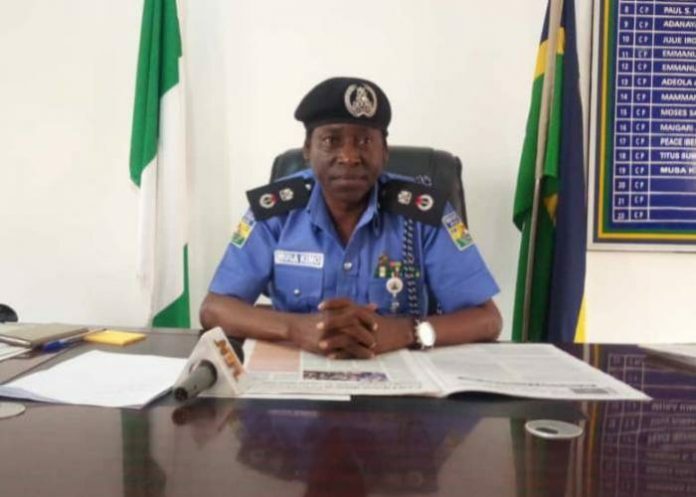 "I really dont get it...."
Police AIG Condemns Killings of Innocent Nigerians Says "It won't Be Tolerated"
The Police Assistant Inspector General (AIG) in Zone 6, Musa Kimo, has warned that the service will not tolerate the killing of innocent Nigerians by any uniform men. Kimo, who gave the warning on Thursday in Calabar while decorating 21 newly promoted officers of the zone, said as police personnel with the responsibility of fighting crime, they must be very professional in the discharge of their duties. He said any policeman that kills illegally would be held responsible for his action. Kimo said the Inspector General of Police (IG) Mohammed Adamu made the promotion with the hope that the beneficiaries will live up to the tenets, and objectives of their calling. “I have known the Inspector General of Police for about 33 years, and I know that he believes in promoting worthy officers. But the police hierarchy is not happy that the force is in the news always for all the wrong reasons. We must change the narrative and not allow Nigerians to die innocently because of us. “If we behave well, majority of Nigerians will be happy with us. Be professional about your job. It is one thing to be promoted and another to work harder, and ensure that you protect your rank. If you don’t, anything can happen,” he said. Kimo expressed gratitude to the IG for promoting the officers and men, and hoped that those promoted will justify the gesture done to them. Among those decorated were two officers from the rank of Inspector to Assistant Superintendent of Police; two others were promoted from the rank of Superintendent of Police to the next ranks, and about 17 others were promoted to their next ranks. 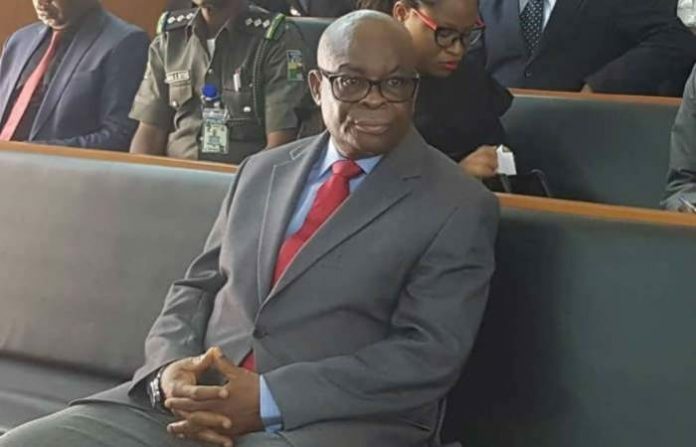 A lawyer and the Economic and Financial Crimes Commission EFCC counsel, Mr. Wahab Shittu, has said that former Chief Justice of Nigeria, Walter Onnoghen, might fight a protracted legal battle against the Code of Conduct Tribunal's conviction. Shittu had reacted to Thursday’s conviction of ex-CJN Onnoghen of breach of code of conduct for public officers. According to the The News Agency of Nigeria reports that the Code of Conduct Tribunal chaired by Danladi Umar convicted Onnoghen, 68, and ordered his immediate removal as the CJN. The tribunal also ordered the forfeiture of money in five accounts which Onnoghen failed to declare as part of his assets. The tribunal also ordered that he should not hold any public office for 10 years. In an interview with NAN, Mr. Wahab Shittu, said, “I believe that the Code of Conduct Tribunal made its own pronouncement, but that is not the end of the matter. “I see Onnoghen exercising his constitutional right of appeal; the matter might be protracted and get up to the Supreme Court. “It is a sad commentary on our judiciary, as no one should celebrate what has happened in this situation where the Number One judge in the country has found himself in this kind of predicament. “It does not call for celebration, it calls for sober reflection and deep concern. “I want to reserve further comments until the machinery of justice is fully exhausted, because I feel the Court of Appeal and Supreme Court will make further pronouncements,” Shittu said.